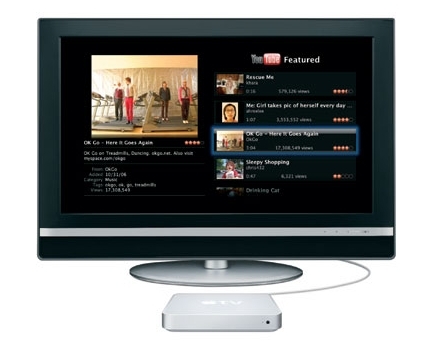 The popular video sharing website, YouTube, will be now on TV courtesy of Apple TV devices. With an Apple TV remote control in hand, users can select video of YouTube from the internet and beam them to their TV to watch. Users can now enjoy watching thousands of movies, TV clips, music videos, videoblogging and short original videos in their living room. Apple revealed that the new Apple TV devices can be plugged into widescreen TV sets or home theater systems and wirelessly connect to computers. Users can thence access to movies, music, pictures, podcasts and other downloaded entertainment contents from YouTube. YouTube members are also able to log-in to their respective accounts via Apple TV to view and upload video clips. Apple also introduced its “built-to-order” Apple TV. The TV comes with a 160GB hard drive which is able to store as much as 200 hours of video, 36,000 songs, 25,000 pictures or combination of the data. The price of this Apple TV is around US$399.